Spectrum Raja has made the words 2G popular with the common man.2G means the second generation mobile services that are offered by the Telecom Companies in India to mobile phone users.The word 2G is just another marketing word used in Telecom industry.2G services helps you to make a voice call over your mobile phone through a GSM mobile network.You could do messaging also through this service.Your data needs were taken care by HSCSD, GPRS and later EDGE.Now you could browse internet through your mobile phone thanks to the data network.Obviously GPRS and EDGE are enhancements of 2G.So they could be rightly called as 2.5G and 2.75G respectively.GSM is the popular mobile network technology in india than CdmaOne (Simply called as CDMA by the marketing guys).Enchancement of CdmaOne that helps you browse internet on your mobile phone are CDMA2000 1xRTT. Companies Offering CdmaOne Service in India are Reliance Communication and Tata Indicom.CDMA2000 1xRTT is the technology standard that the USB internet browsing devices used by Reliance NetConnect and Tata Photon.The NIC Card of the BSNL also in this service. 3G services are third generation mobile telephony services that works on latest technology evolved and would replace the exisiting telephone network so that people will gradually be upgraded to the latest mobile network.So the newer service would be backwardly compatable with the exisiting 2G networks. 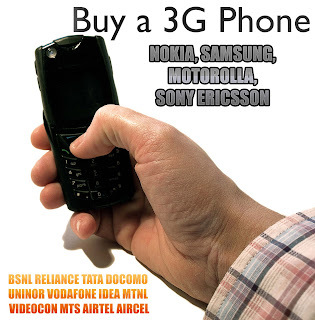 Right now only BSNL and MTNL were the only 3G services provider since they got licences before the others.Now Reliance and Tata Docomo have rolled out 3G services.Idea, Airtel and others will follow suit.3G is going to revolutionised your life.Mobile phone itself is a wonder.Imagine a common man being able to carry out face to face video conferencing (or just a video call) using his mobile phone.Ofcourse for a video call to be carried out both phones must be 3G ready and with front side camera on top of the display where you would see the face of the fellow caller. Indian Telecom companies are using WCDMA technology standards to upgrade a GSM user to 3G.The technology HSDPA will be employed so that you can get minimum 2 Mbps speed on your mobile phone.There is no standard speed yet one can assume that you would get a minimum speed of 384 kbps when you are travelling in a fast train.So 3G has made possible for people to go wire free and get hooked to a mobile broadband connection using a 3G mobile broadband HSDPA USB Stick.For the 2G Cdmaone phone network people the upgrade for them to 3G is CDMA2000 1xEVDO.BSNL has rolled out EVDO high speed mobile broadband usb modems delivering 2mbps speed even two years back.Reliance and Tata also provide same services under the names of Reliance NEtconnect+ and Tata Photon Plus (i am not sure of the names). You can do video call.You can see the other person while talking.Now your boss / girlfriend can see your grin. LiveTV on your mobile phone.Our mobile phone companies will soon get tie up with content providers and will make sure that you get to see popular tv channels live streamed in your mobile phone at hefty charges. Download Videos and movies for a free within lesser time. More security promised and boasted by 3G network. 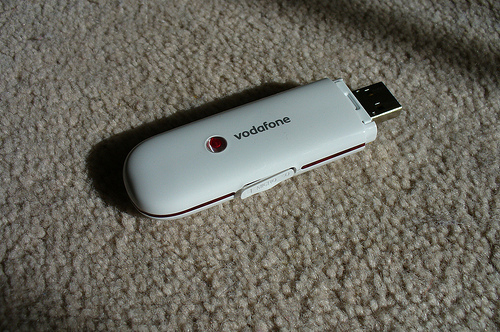 Mobile Broadband using a USB Stick on your laptops, PCs etc. Expensive Waste devices like iPad and similiar tablets would support 3G.You can buy them if you damn care about how to spend your money.If you are a millionaire they are a must buy. Of course a new phone.You need to buy a 3G compatable phone and they are expensive.Starts from Rs 4000+. World has seen 3G much before India.Thanks to our bad telecom policy, delays and spectrum Raja.Japan got it in 2001.South Korea in 2002.Europe got in 2001.Australia got in 2002.US got CDMA2000 1X EVDO on 2003.But unfortunately Indians got it only in 2010.Never mind we shall make it popular soon.There might be negatives but we want the technologies the world is using like DTH - a new industry created out of nowhere because indians embraced it.We Indians are slow in everything. How many high definition channels are there in India? I might get another question as reply from you. "How many high definition tv sets are there in india?" "U introduce ppl will embrace".